Summary (from Goodreads): The year is AD 94. When the evil Emperor Domitian sends soldiers to seize his family's home in the middle of the night, Juba must escape with his brother and sisters, and journey to distant Britannia on the edge of the known world. His task: To avoid capture and death. His quest: To find a safe haven in Britain. His destiny: To save the children. It has the distinction of being one of the few books I've read in recent years which I actually knew about prior to publication (although I didn't realise it was out until I came across it at the library last month). It's the first in a new series, which is a (sort of) sequel to the Roman Mysteries series, which was one of my favourite series when I was younger. It's been seven years since the last book in that series was published, so obviously I was very much looking forward to reading this one, and it did not disappoint. 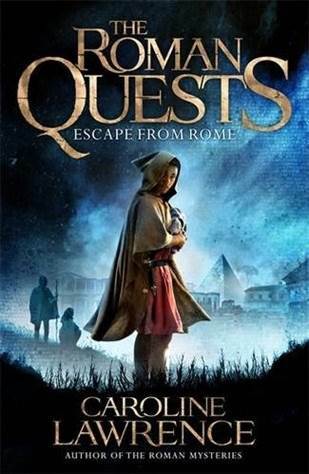 I think I liked it even better than most of the Roman Mysteries books. The characters. I liked the characters a lot. They were all well-drawn with interesting and unique personalities, and they all developed a lot during the course of the story. Ursula especially I liked; she is kind-hearted and likes animals (like Nubia in the Roman Mysteries series), but is also pretty fearless and much more confident than Nubia. Juba and Fronto also were well developed and the other characters the children meet along the way, Castor and Bouda, I also liked a lot (as characters). The story. The plot was quite character-driven, as the major plot points mainly rested on the children having to make difficult decisions, about whether to do the right thing or not. But there is also a fair amount of action and enough tension to keep the story moving. Plus the reappearance of some old friends from the Roman Mysteries series definitely added to my enjoyment of the book. However, there is no need to have read the series to understand or enjoy this book. Overall, I really did like this book, more than I thought I would! Now I have to wait until October to read the next book in the series.